Today, Muffin fans, we welcome Cathy Turney, a runner up in the Summer 2012 Flash Fiction contest. If you haven't had the opportunity to read her humorous story, What I Do For Love, be sure to check it out. Then come back and get to know this author! 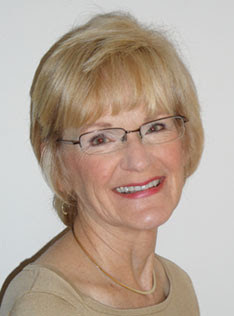 Cathy Turney has been a lifelong resident of the San Francisco Bay Area. She was in the first graduating class of the University of California at Santa Cruz where she majored in psychology because she thought she wanted to be a social worker. Her husband (referred to in her humorous stories as MyHusbandTheEngineer) says she is a social worker—that’s what being a real estate broker is all about! Cathy found that her favorite part of writing her real estate newsletter was reporting on the antics of her dogs. They became notorious; “What have Bubbles and Spot done lately?” was a frequent question as she met people in her neighborhood. Readers wanted more, so she self published Tales of a Codependent Pet Owner—My Life with the Poodle from Hell and a Deaf Dalmation through CreateSpace in November, 2011. Cathy has won several humor awards and her stories have been published in theSan Francisco Chronicle and Bay Woof Magazine. Recently she was invited to write a humor column for The Martinez News-Gazette and the Digital Concordian. In her column, entitled “A Little Bit Off,” she captures the humor in coping with technology and social media, her left/brain right brain marriage and her codependency on dogs. Cathy encourages anyone with a story to tell to jot down notes, organize them, start writing and publish! With the amazing technology available today, she says, any writer can share his/her stories with the world. Cathy: Yes, all those things did happen! You may have sensed that I am NOT enamored of that car! Laughter is my defense. Fortunately, MyHusbandTheEngineer saw the humor in the story – especially when the national Austin Healey organization found it humorous, too, and ran it in their September “Healey Marque” magazine—which gave my writing relevance in my husband’s eyes J.
WOW: Isn’t that a great feeling! I know you write a real estate newsletter and it evolved into a book about your dogs. What was that process like? WOW: Encouragement from fans is so important. It’s a testament to our writing. I also checkedyou’re your website; great content. What are some benefits you've discovered about blogging/writing daily? Cathy: Oh, THANK YOU for your positive comment about my website!! I post regularly, and I post a “finished product” because I want my website/blog to be my “portfolio” of writing. I would love to be published in some major cities’ newspapers and/or national magazines, and feel that if I look consistent and as polished as possible, I’ll be building my odds. I’m not interested in the money – I’ll do it for free!! I just love creating laughter and sharing it (and getting feedback J). WOW: I agree that it’s important to have a fantastic portfolio of polished work to pique the interest of potential customers. I’m wondering how you approach the writing process. Cathy: Oooooh! Describe my writing process!!! I sure wish I could formulize it! Wouldn’t that make everything easier?! Here’s what I do, though: I take notes all the time. If something funny, absurd, annoying, anything that gets a reaction from me happens, I jot it down—especially the actual words that seem humorous. So often it’s not what actually happens, but how it’s related that’s funny. Eventually, I collect these notes from all over the house, my car, my purse, and categorize them. Then I try to create a story and keep going back to it to make it funnier and funnier. It’s really important, I’ve found, to leave the story alone at least overnight. And getting up from the desk and walking the dogs allows my mind to free associate. A double benefit! When I think it’s done (or done enough—does a writer ever feel his/her work is done?! ), I send it to a wonderful lady who has a sense of humor and calls herself “The Grammar Guru!” She catches the boo-boos. WOW: I need to learn to let the story sit overnight. I’m usually too eager to jump right in. Cathy, I’m wondering what advice you would offer writers who may be contemplating publishing. a. Start a blog. That makes you feel that you aren’t just writing into the ether. Actually, you are, but someone out there will read it which they won’t do if you just keep it on your desk. Remember, a book is just a sequence of stories strung together. b. Join the local writers’ club. I joined the Mount Diablo branch of California Writers’ Club, and it gets me out among people with similar goals and I learn from their experiences. I’ve gleaned marvelous tips from just being there. And they have great, inspiring guest speakers from whom I’ve learned lots. d. If there’s a particular genre in which you write, find the best authors in that area and read them. Aspire to be as great as they are – anything less will still be great! e. If you’ve never published a book before, self-publish! It opens doors. It tells the world that you organized your ideas, wrote them down and made it through the publishing process—that you have the drive and commitment to see a major project through to completion. You can build on that; you’re more likely to get magazines and newspapers to publish your articles which, in turn, will help open doors with traditional publishers. I think it’s important to have a hard copy book (Amazon’s CreateSpace is marvelous!) for your first effort. After that, I think e-books are fine. And anyone can self-publish a paperback book! The great thing about self-publishing is that you can be on Amazon and look as good as John Grisham – no one will know you self-published. f. Hire a professional proof reader. Your published book has to be perfect as far as grammar, punctuation, spelling and syntax go. WOW: Great advice to contemplate, Cathy! Thanks for taking time to visit with our readers today, and once again, congratulations on earning runner up honors in the WOW! contest. Cathy: Well, LuAnn, I thoroughly enjoyed sharing my ideas, here! Thank you so much for the opportunity! And I LOVE WOW! What a fun interview. I'm looking forward to checking out your blog. Congratulations on the contest.